Randy and I made the decision before marriage that I would be a Stay-At-Home Mom. The month that I walked away from my job for the last time happened to be Randy’s birthday month. Planning to flex my homemaking prowess, I decided to make him a special breakfast before he left for work. I made pancake batter the night before, hiding the covered bowl in the back of the fridge, giddy. The morning of, I woke earlier than my Mister (a feat when you’re 8 months pregnant, I tell you) and started multitasking my pancakes and homemade maple syrup. Pregnancy brain, early rising, and distraction had me using double the water instead of double the sugar that syrup requires. The second that that “syrup” touched the pancakes, it soaked in like water to a dry sponge. They expanded to triple their size, barely being considered substance at all, drowning. The naked terror that shown on his face that he’d have to endure this meal after just one bite was laughable. 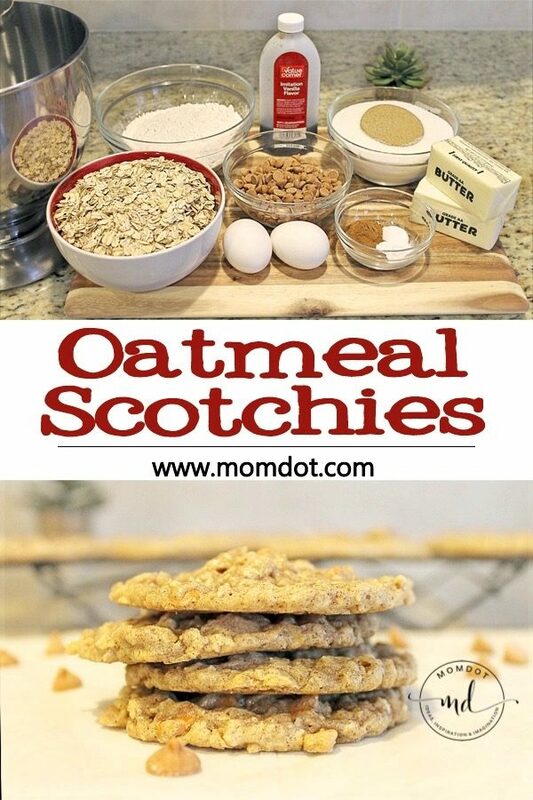 Wanting to redeem myself, I decided to make his favorite cookies: Oatmeal Scotchies. I was near ecstatic at the thought of presenting them to him as he walked through the door. All that excitement when out the window, however, when I pulled the first batch from the oven. They had “melted” in the pan, becoming one massive cookie. Tenderly, gingerly, I tried to pry them from the pan, attempting at some semblance of “single cookie.” I was halfway through one cookie when the spatula powered through a particularly stuck-to-the-pan part, bulldozing through the rest of the pan, leaving cookie remnants in its wake. It was then that I called my mom, crying. Because I was sobbing so pathetically she thought something horrible had happened, seeing as I was 8 months pregnant. And it had! I’d ruined both of my birthday gifts for my husband’s first birthday after our marriage! Disappointed, frustrated, and completely embarrassed, I scraped the “cookies” and remaining batter into the garbage, cleaned the kitchen, sprayed some Febreeze to mask the scent of the favorite cookies he would not be eating (I didn’t burn them, after all– the house smelled divine), and presented him with a cookie-less kiss and smile as he walked through the door. In a large mixing bowl or stand mixer, cream together butter, brown sugar, granulated sugar and vanilla extract until light and fluffy. Add eggs; beat until well blended. 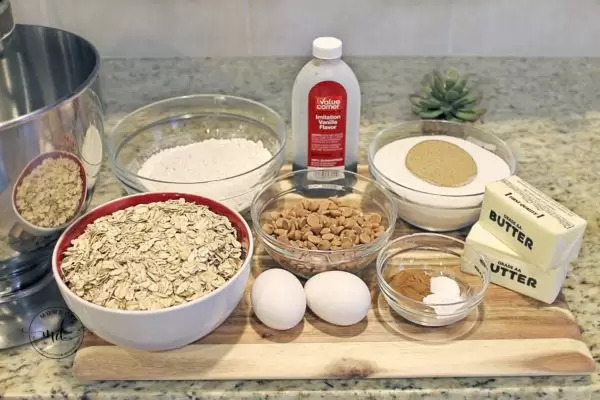 Combine all-purpose flour, ground cinnamon, baking soda and salt in small mixing bowl. Gradually add to butter mixture until well blended. Stir in old-fashioned oats, butterscotch chips, and optional chopped walnuts. 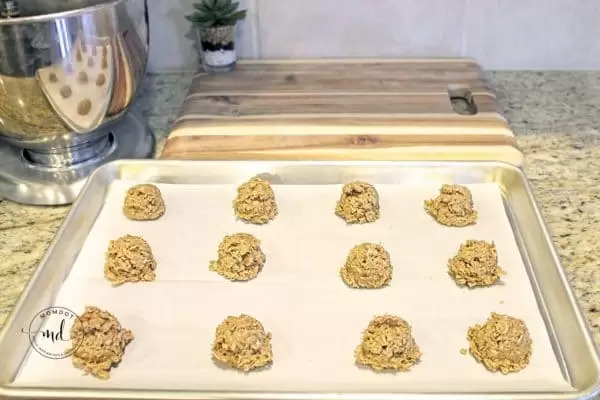 Drop by spoonfuls (or Tablespoon cookie form scoop) onto greased or parchment-lined cookie sheet. 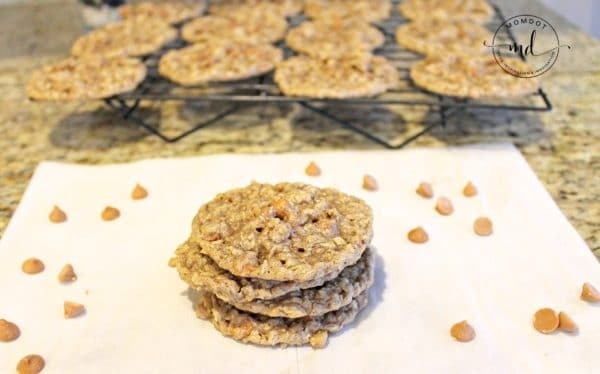 Allow cookies to cool on the baking sheet for approximately 7 minutes before transferring to a wire cooling rack. Once completely cooled, store in an airtight container. Combine all-purpose flour, ground cinnamon, baking soda, and salt in a small mixing bowl. Gradually add to butter mixture until well blended. Stir in old-fashioned oats, butterscotch chips, and option walnuts. 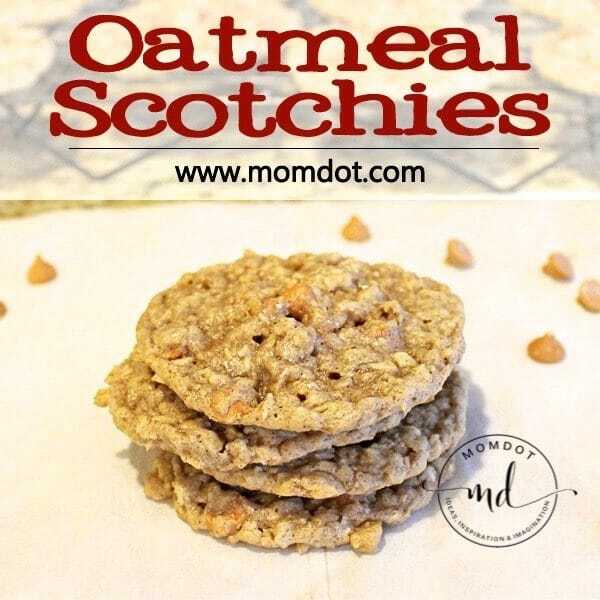 Drop by spoonfuls (or Tablespoon cookie form scoop) onto greased or parchment-lined cookie sheet. Bake at 350 degrees for 10-12 minutes. Allow to cool on baking sheet for approximately 7 minutes before transferring to wire cooling rack. Store in airtight container. These giant Old-fashioned cookies are incredible with or without Butterscotch chips. They’re delicious with Raisins or Chocolate chips, too. All-in-all, they’re just a delicious cookie! Hope you like them! I love these cookies. I also love that you can switch out the butterscotch chips and add in something that you love. I have also tried adding Chocolate in with the Butterscotch. I love those flavors together as well.